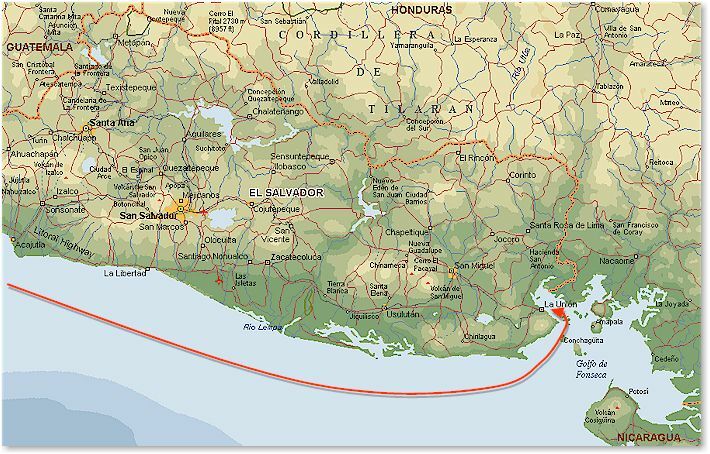 Our next port of call was La Union (N13.20, W087.50) in El Salvador, 180 miles away. This country seemed to be even less developed than what we had seen previously. The town was covered with garbage that was being collected from the streets each night. The coast line consisted of a mixture of mud and garbage - offering an unpleasant walk of almost a quarter mile from the shore to where the dingy was able to swim at low tide. The story on how I sailed on a small vessel around Central America. Using the phone was becoming increasingly difficult, and I had trouble updating my voice mailbox in the US. Long distance calls were operator assisted and only possible from the office of the local phone company. That's where we ran into a western looking woman who seemed to be excellent in Spanish and everyone's friend. It turned out that she was one of four missioners working for 'Mercy Ships', a medical support agency from the US. She invited us to their home, where I was not only able to use a phone and check my email, but where we also were invited for lunch and later on for dinner. Al and his gang turned out to be extremely friendly people and we had a great time experiencing this country on a different note. While checking my voice mail, I received the OK from Steve from 'Solitaire' to join him on his trip from Panama to Cuba. Since my time on Mike's ship had gotten a bit long and uneventful, I had decided to go off his boat in Panama. This was also meant as a precaution for the Atlantic side which I expected to be rougher than what we had seen in the Pacific. In my eyes, neither Mike's nor my experience nor the state of his boat were adequate for a save journey across the Caribbean Sea. Steve's boat and his experience made me feel more comfortable (and, indeed, it shouldn't take long to prove this...). His ship, a 42 feet Barnet custom designed racing-cruiser from New Zealand, seemed to offer some more active sailing experience - something I was still looking for. That's why I had asked to join him. Throughout the next days we decided via voice and e-mail to meet in Panama for the transit and then take off for Cuba. Mike was disappointed to hear my decision but understood my motivation and agreed to make it to Panama on a faster pace to be able to meet Steve who was already ahead of us. The next day we left the Golf of Fonseca on its ebb tide giving us an additional push of 2 to 3 knots. 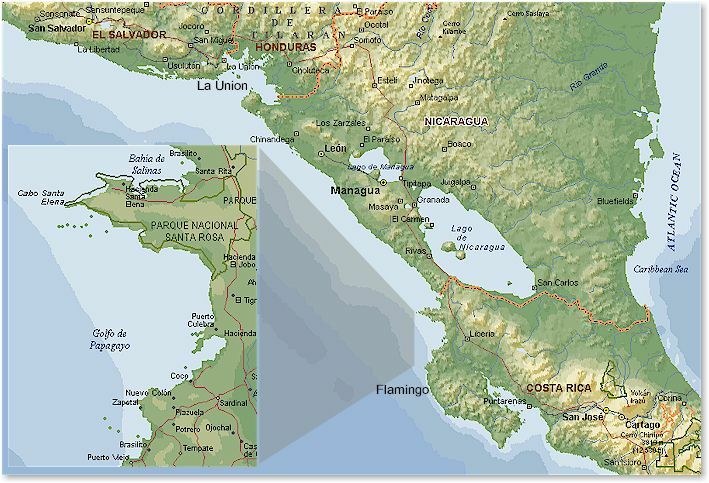 In the interest of time, we bypassed Nicaragua and headed for Flamingo (N10.56, W085.43) in Costa Rica, 200 miles down the coast offering one more challenge: The Golfo de Papagayo - well known for its stormy north winds. When I decided to go on this journey, I knew that I would spend Christmas in a different way than usual. Yet, I did not know how different it actually would be. The sail down the Nicaraguan coast was smooth and easy: light winds and some motoring - the same old. Our GPS calculated an ETA (Estimated Time of Arrival) in Flamingo for early morning on Christmas day. After a regular meal (probably the least fancy meal I ever had on Christmas Eve) Mike went below, and I watched the half moon as it made its journey across the sky. Orion was ahead of us, as usual in early evenings, and the big tipper was still below the horizon in the north east. It seemed like one of those calm and long nights was awaiting me. I had time to think of other parts of the world - particularly my family at home. I imagined how they had celebrated, with singing and a tree - nothing of which we had here (not even the cookies!). Just as I was wondering whether they might had gone to the 'Christmette' in the dome at mid night, the winds picked up: We were entering the Golfo de Papagayo. All of a sudden it was blowing so strong that our auto pilot quit steering - too much pressure on the rudder. I had to take over and was facing easterly winds of force 4 to 5, around 25 to 30 knots. I shortened sails. Our ETA had suddenly jumped up to 11pm tonight. The next three hours I spent steering us through the golf. Trying to keep the wind on a beam reach at a right angle to port (the left side), gusts frequently sucked the bow to the left and high waves turned us into the wind. I had to counter steer with hard rudder to starboard which required all my strength in arms and legs. The winds were strong but felt manageable. 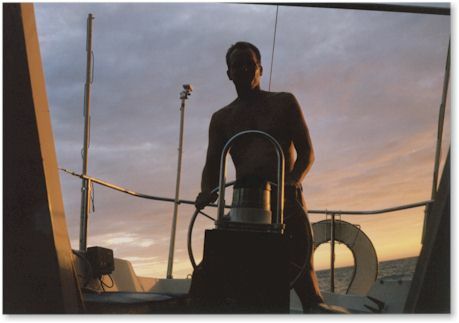 I was wearing my life west, tied to the rudder, and had a real work out while my walkman was playing Supertramp. What a Christmas night! 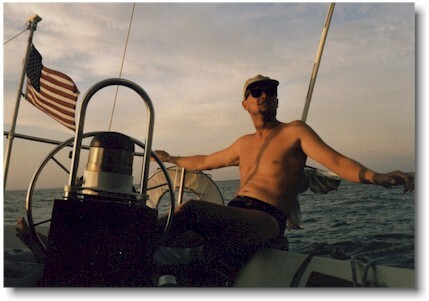 When Mike finally took over we had passed the Golf and he motored us to the anchorage at Marina Flamingo.